How Now, Brown Brazilian Cow? Cows have four stomachs, but the recent news about Brazilian cow meat is quite hard to stomach for most people. Brazil’s beef industry is in a tight spot right now, as there have been allegations of tainted meat and corruption of industry regulators. In this article, we will look at the key points of the scandal and what it might mean for everyone. First, some information on Brazil’s agricultural sector would be useful for us to grasp the magnitude of the news. Brazil is currently the world’s top exporter of beef in the world, tied at first place with India and contributing to 19.60% of world beef exports. The optimal combination of being in the Equatorial region, having fertile soil, and a large land mass all contribute to Brazil’s dominance in the cattle market. 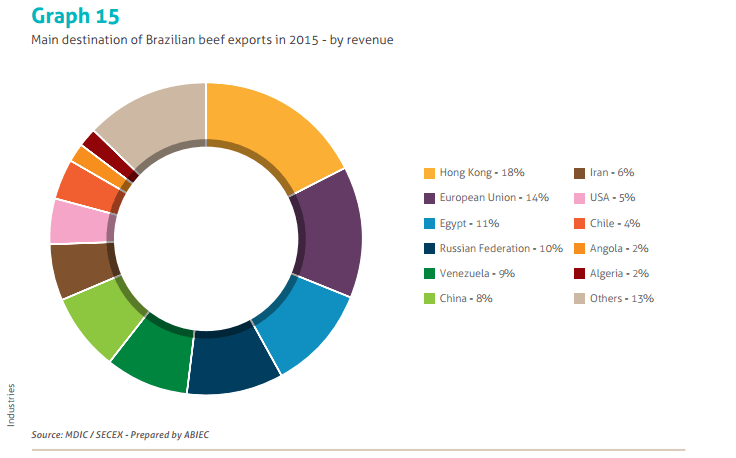 To Brazil itself, beef exports are also critical to its growing economy, making up 30% of its agricultural sector’s activity (which in turn makes up 21% of Brazil’s total economy). Evidently, the industry plays a big part in the employment of Brazilians, with employee remuneration amounting to R$11.37 billion in 2015. Any hit to the industry will surely impact the livelihood of a vast segment of Brazilians. We can also see from the chart below, the Brazilian beef industry appears to have hit a peak or plateau, indicating the industry is at its peak importance now. 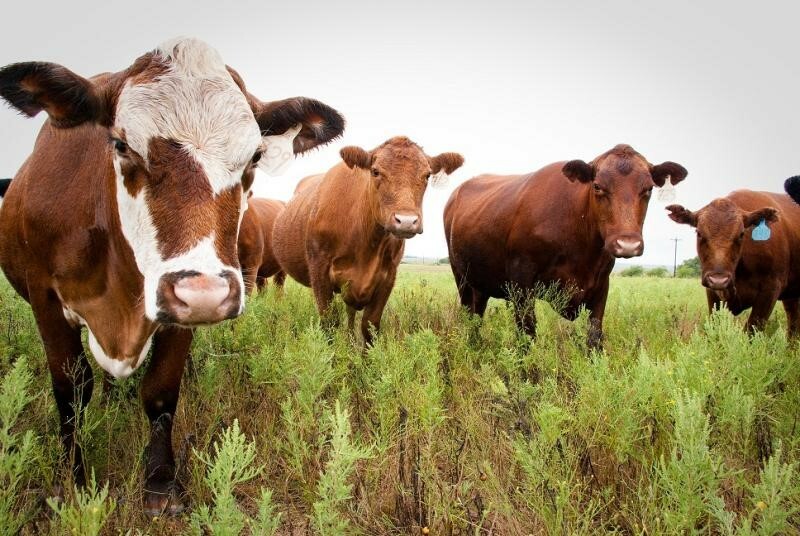 Read more about Brazil’s beef industry statistics here. Brazil has its favourite customers in terms of importers of beef. For this case, we should note the significance of Hong Kong, the EU, China, Egypt, and China. Their importance will be clear later in this article. Now that we’re clear about the scale of this commodity for Brazil, we can explore the details of the scandal with greater clarity. It all began on the 17th of March, where the federal police filed an accusation of bribery by several beef-producing companies to get regulators to approve meat of sub-par health standards. Among such hazards are rotten meat, salmonella, excessive use of dangerous additives, and bulking their meats with other substances. The whistleblower, Daniel Gouveia Teixeira, was the catalyst behind the police investigation. His removal from his post upon confronting a meat plant not meeting health and safety standards nearly 3 years ago prompted him to suspect corruption in the higher levels (read his story here). He certainly isn’t someone you would want to have beef with! Thus, Operation Weak Flesh was launched by the authorities. Operation Weak Flesh is a probe into the agricultural inspectors suspected of bribe-taking, as well as owners of the involved meat facilities. As of now, 6 plants have been ordered to halt operations temporarily, while a total of 21 plants are included in the police inquiry. The police have announced their findings to be isolated and not indicative of a structural problem in the country’s industry, which is crucial for any chance of recovery. As we can imagine, such a scandal is a massive taint for the Brazilian meat industry. Consumers around the world will begin to doubt the safety of meat products from Brazil, and it will adversely impact demand. A great example would be the UK and how it suffered from the Mad Cow disease outbreak (read more here), it was clear how that health scare affected meat demand from the UK for many year (and to some extent until today). 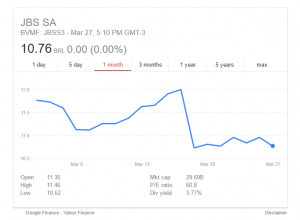 In particular, Brazil’s largest meat producers, JBS and BRF, felt the hit. 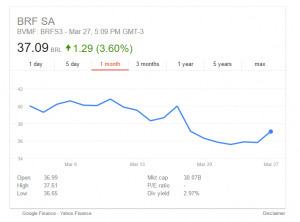 A quick look at the share prices of these two companies revealed what we would expect, a massive drop, reflecting investors’ confidence vanishing. 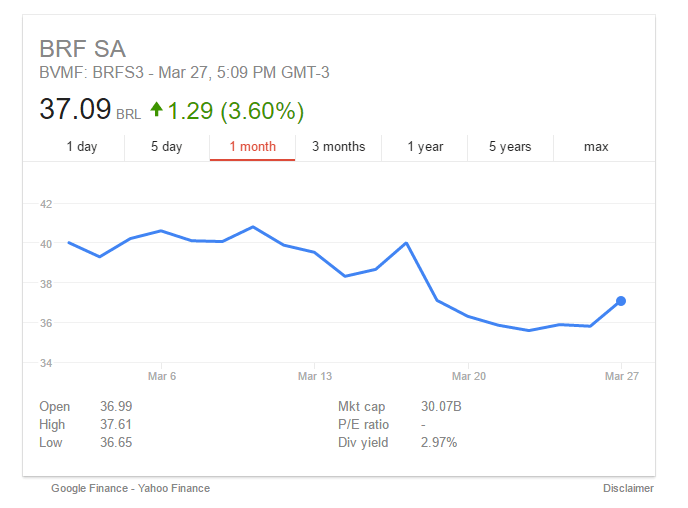 JBS and BRF saw 10.6% and 7.25% of their share prices wiped out respectively, in just a day. However, they were not cowed by the incident and strongly maintained that they were clear of any wrongdoing. Both companies have been trading sideways since the scandal erupted as investors are watching closely to ascertain whether there is any chance of recovery, or instead some form of incriminating evidence will be found against them. On a wider scale, Brazilian meat products have been either partially or completely banned from China, Chile, Egypt, Hong Kong, the EU and South Korea. In particular, China and Chile banned all meats from Brazil, as opposed to the partial ban only from the affected plants by the EU. Brazilian president Michel Temer treated diplomats of the major importing countries to a meal at a local steakhouse in attempts to allay their fears and convince them that the problem was not severe, but it did not seem to have worked very well. Fortunately, on the 25th of March, China, Chile, and Egypt softened their stance on the ban and allowed non-tainted meat from other plants to enter their respective countries. The alleviation of the ban was a welcome relieve for meat exporters in Brazil. We can scrutinise the situation until the cows go home, but what matters ultimately is the impact of this issue, both on the South American economy and for the layman consumer. Should this scandal not be resolved in a timely and robust manner, demand of beef products will move towards other major exporters (such as India). This will boost the economies of other meat producers to a certain extent. In such an adverse scenario, global meat supply will be hampered, and for any given demand level, this may mean higher prices for beef. 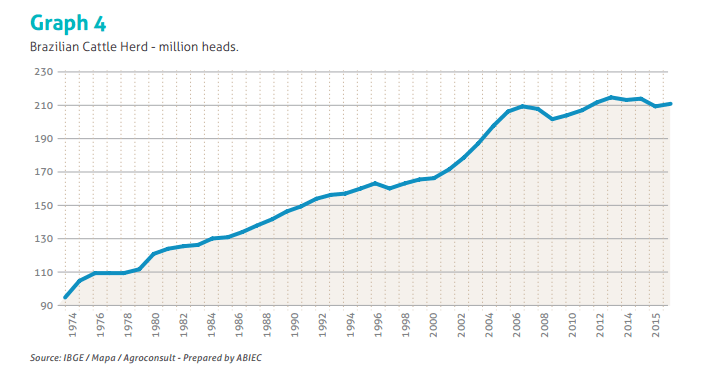 This impact is only possible due to the dominance Brazil holds over the global market for beef. However, such an extreme case is unlikely, as it is very difficult for the Brazilian meat export market to be completely shut down just like that. A more realistic scenario will be a temporary scare of Brazilian beef and a reduction in the demand of such products without much shock to the other exporters. This will impact the Brazilian economy through various channels. The first channel will be the Balance of Trade, where export value will decline. There will be a reduction of inflow of funds into the country and a reduction of income of the Brazilian people. This will then lead to a possible (minor) contraction of the economy. Growth for the quarter, or even the year, might see lower numbers as production, profits and income in the overall economy will decline (think of these meat producers with less income and thus less money to spend on goods in the economy, which will impact everyone). 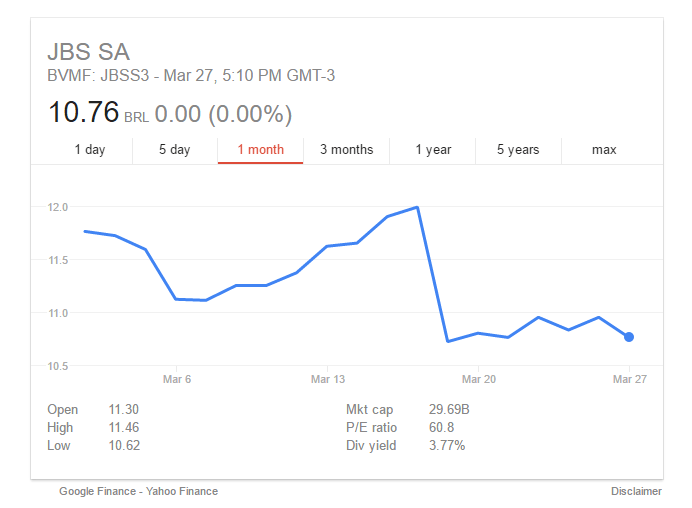 Finally, if the scandal does not abate, jobs may be affected and layoffs may occur, raising unemployment in Brazil. However, the future may not be as pessimistic and bleak, as the case seems to be showing signs of resolution and repair. With the positive attitudes of the countries that have recently reviewed the ban and confident statements from JBS, BRF and the authorities and president, it may be handled with minimal damage to the meat industry and the Brazilian economy as a whole. On the side of consumers, you may begin to see less meat products originating from Brazil in your local supermarkets! A shining beacon amidst the gloom comes in the form of Trump and his protectionist trade policies. It is anticipated that the U.S.’s increased barriers to trade and their withdrawal from the Trans Pacific Partnership will pave the way for greater business opportunities of Brazil with other countries, especially Asian nations. Mexico will become a crucial trade ally as each country seeks to reform new ties to fill the void that may be left when the U.S. reduces trade with surrounding countries. This may be a counterweight to the adverse impact on the demand for Brazilian beef. Read more about Brazil’s Agriculture Minister’s thoughts here. To sum things up, a myriad of factors is at play and there will be negative impacts on the Brazilian economy. However, with good governance and solid actions taken to rectify the problem, confidence will be restored and the effects will be mitigated. Trading commodities such as cattle produce? 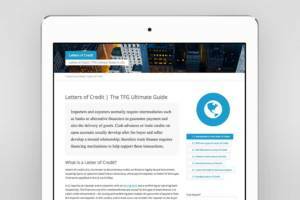 Find out more about our Structured Commodity Financing Products here. Yuen Kit is currently working in the Central Bank of Malaysia, having graduated from the University of Warwick with a Bsc Economics degree. He enjoys analysing financial markets, with a special interest in big data analytics and econometric research. Writing has always been a passion for him; this explains his tendency to write finance-related articles, especially on topics regarding investing and trading. He was also an author at the Market Mogul. In his free time, he enjoys reading and playing chess.